You can use the “Openreach line checker” which will tell you if fibre broadband is available now and the broadband speeds you can currently get at your address. In the “areas now live” section you’ll find a list of areas which have now been upgraded and those which are coming soon. 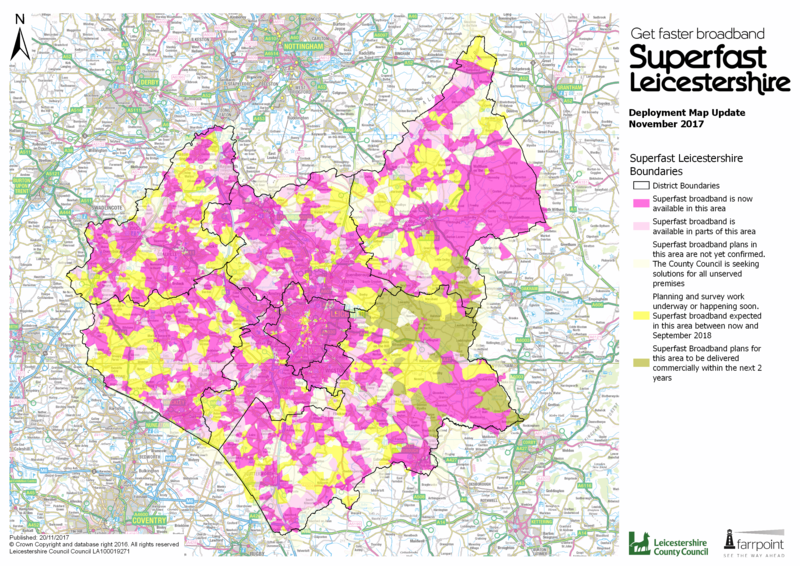 In the “expected coverage” section, you’ll see an overview map of all existing and planned coverage for Leicester and Leicestershire. These pages will be updated regularly so please check back if your area is due for upgrade in coming months. Alternatively you can also register for updates here. Please note – each area in our rollout is subject to detailed planning and survey work. The location of all new green roadside cabinets will be focused on reaching as many properties as possible with superfast speeds. Until surveys are complete and build is underway, information provided remains subject to change. Click on one of the tabs below to find out more. Below is a list of towns and villages which have already been upgraded to superfast fibre broadband through the Superfast Leicestershire project. If your area is listed below check out our top tips to upgrade. If you have any questions about when you can expect your area to join the list get in touch. Superfast broadband is now available in areas of: Aston Flamville, Blaby, Braunstone Town, Cosby, Countesthorpe, Croft, Elmesthorpe, Enderby, Glen Parva, Glenfield, Huncote, Kilby, Kirby Muxloe, Leicester Forest West, Lubbesthorpe, Narborough, Potters Marston, Sapcote, Sharnford, Stoney Stanton, Thurlaston & Whetstone. Superfast broadband now available in areas of: Anstey, Barkby, Barkby Thorpe, Barrow upon Soar, Beeby, Birstall, Burton on the Wolds, Cossington, Cotes, East Goscote, Hathern, Hoton, Loughborough, Mountsorrel, Newtown Linford, Prestwold, Queniborough, Quorn, Ratcliffe on the Wreake, Rearsby, Rothley, Seagrave, Shepshed, Sileby, South Croxton, Swithland, Syston, Thrussington, Thurcaston, Thurmaston, Ulverscroft, Wanlip, Woodhouse, Woodhouse Eaves, Woodthorpe, Wymeswold & Zouch. Superfast broadband now available in areas of: Airfield Business Park, Arnesby, Ashby Magna, Ashby Parva, Billesdon, Bitteswell, Bringhurst, Broughton Astley, Bruntingthorpe, Burton Overy, Catthorpe, Church Langton, Claybrooke Magna, Claybrooke Parva, Cotesbach, Dunton Bassett, East Langton, East Norton, Fleckney, Foxton, Frolesworth, Gaulby, Gilmorton, Goadby, Great Easton, Great Glen, Great Stretton, Gumley, Hallaton, Hungarton, Husbands Bosworth, Illston on the Hill, Keyham, Keythorpe, Kibworth Beauchamp, Kibworth Harcourt, Kings Norton, Leire, Little Stretton, Lubenham, Lutterworth, Magna Park, , Medbourne, Misterton, Mowsley, Newton Harcourt, North Kilworth, Noseley, Owston, Owston, Peatling Parva, Rolleston, Saddington, Scraptoft, Shawell, Shearsby, Skeffington, Smeeton Westerby, South Kilworth, Stoughton, Stretton Hall, Swinford, Theddingworth, Thorpe Langton, Tilton on the Hill, Tugby, Tur Langton, Ullesthorpe, Upper Bruntingthorpe, West Langton, Willoughby Waterleys & Wistow. Superfast broadband now available in areas of: Bagworth, Barlestone, Barton in the Beans, Barwell, Belcher’s Bar, Bilstone, Botcheston, Bufton, Burbage, Burbage Common, Cadeby, Carlton, Congerstone, Dadlington, Desford, Earl Shilton, Fenny Drayton, Groby, Higham on the Hill, Hinckley, Kirkby Mallory, Market Bosworth, Markfield, Merry Lees, Nailstone, Newbold Verdon, Norton Juxta Twycross, Odstone, Orton on the Hill, Osbaston, Osbaston Hollow, Peckleton, Pinwall, Ratcliffe Culey, Shackerstone, Sheepy Magna, Sheepy Parva, Sibson, Stanton under Bardon, Stapleton, Stoke Golding, Sutton Cheney, & Twycross. Superfast broadband now available in areas of: Ab Kettleby, Asfordby, Asfordby Hill, Asfordby Valley, Ashby Folville, Barkestone le Vale, Barsby, Bottesford, Branston, Brooksby, Burrough on the Hill, Cold Overton, Croxton Kerrial, Easthorpe, Eastwell, Eaton, Frisby on the Wreake, Gaddesby, Goadby Marwood, Great Dalby, Grimston, Harby, Harston, Hoby, Holwell, Hose, John O’gaunt, Kirby Bellars, Knipton, Knossington, Long Clawson, Melton Mowbray, Muston, Nether Broughton, Normanton, Old Dalby, Pickwell, Plungar, Potter Hill, Ragdale, Redmile, Rotherby, , Scalford, Somerby, Stathern, Thorpe Satchville, Twyford, Waltham on the Wolds, Wartnaby & Wartnaby. Superfast broadband now available in areas of: Acresford, Albert Village, Appleby Magna, Appleby Parva, Ashby de la Zouch, Battram, Belton, Blackbrook, Blackfordby, Castle Donington, Coalville, Coleorton, Diseworth, Donisthorpe, East Midlands Airport, Ellistown, Griffydam, Heather, Hemington, Hugglescote, Ibstock, Isley Walton, Kegworth, Kings Mills, Lockington, Long Whatton, Lount, Measham, Moira, Nanpantan, Newbold Coleorton, Newton Burgoland, Normanton le Heath, Oakthorpe, Osgathorpe, Packington, Shardlow, Sinope, Snarestone, Spring Cottage, Staunton Harold, Swannington, , Thringstone, Whitwick, Willesley Wood Side, Wilson & Worthington. The Superfast Leicestershire upgrade of Leicester City is now complete. Superfast broadband now available on: Abbey Street, Abbey Park Street, Ambleside Drive, Astill Lodge, Aylestone Road, Beaumanor Road, Belgrave Road, Berridge Street, Bevan Road, Briton Street, Broad Avenue, Burton Street, Charles Street, Christow Street, Church Street, Cobden Street, Crafton Street, De Montfort Street, Dillon Road, Drummond Road, Ealing Road, Ethel Road, Freeman Road North, Gipsy Lane, Gisbourne Court, Grace Road, Granby Street, Gwendolen Road, Haymarket Shopping Centre, Heritage Way, Herongate Road, High Street, High View Close, Horsefair Street, Humberstone Lane, Humberstone Road, King Street, Kingsley Street, Kitchener Road, Linden Drive, Malabar Road, Millstone Lane, Owen Close, Parker Drive, Peacock Lane, Princess Road East, Princess Road West, Regent Road, Rutherford Road, Saffron Lane, Sandown Road, Sherringham Road, Southfields Drive, St Peters Lane, St Saviours Road, Trevino Drive, Uxbridge Road, Wenlock Way, Western Road, Wigston Street, Wycombe Road, Lyncote Road, Southampton Street, Uppingham Road, Church Gate, Welford Road, Bede Street & Freemans Common Road. Superfast broadband now available on: Albion Street, Aylestone Lane, Beaumont Street, Bedford Road, Berridge Drive, Brington Close, Bush Lock Close, Canal Street, Canon Close, Castleton Road, Chapel Street, Chartwell Drive, Church Street, Clipstone Gardens, Cornwall Road, Countesthorpe Road, Cross Street, East Street, Eastmere Road, Ervins Lock Road, Fairstone Hill, Foxton Lock Close, Gartree Road, Glen Road, Gloucester Crescent, Grange Road, Grasmere Road, Harborough Road, Harrison Close, Honeywell Close, Irlam Street, Lansdowne Grove, Leicester Road, Lock Gate Close, Lock Keeper Close, London Road, Lyon Close, Magna Road, Mandervell Road, Manor Street, Mere Road, Midland Cottages, , New Street, North Street, Parlour Close, Penney Close, Pochins Bridge Road, Pullman Road, Radnor Road, Radnor Road, Sandown Road, Station Road, Taylors Bridge Road, The Parade, Thirlmere Road, Towpath Link, Turner Rise, Two Steeples Square, Victoria Street, Viking Road, Weir Close, West Avenue, Wickham Road, Wigston Road & Wilson Road. The map pictured above is an overview of our new coverage map which shows our expected fibre broadband roll-out to residential and business premises in Leicestershire by the end of September 2018. To view the new coverage map, zoom in, and search by postcode please click on our interactive map. Whilst the interactive map provides more detailed information than our previous map it is still high-level only. Coverage by suppliers does not fully align to full postcode and it is, therefore, not accurate to premise or postcode level. You can also use the BT wholesale checker where you can see what exchange you are connected to and the cabinet number as well as the speeds you can receive. Visit https://www.btwholesale.com/includes/adsl/adsl.htm to find out more. The map will be updated every 8-10 weeks as new areas go live. The last amendment was 24 November 2017. © Crown copyright. All rights reserved. Leicestershire County Council. LA100019271. Published 2017.